1. Place the fish sauce, vinegar and sugar in a pan with 3 tablespoons of water. Heat until sugar has dissolved. Allow to cool slightly, then add chilli, garlic and half lime juice. Place the veg in a bowl and toss with the noodles. 2. Heat oil in a frying pan, then tip in the prawns with the rest of the lime juice, Tabasco and some sea salt. 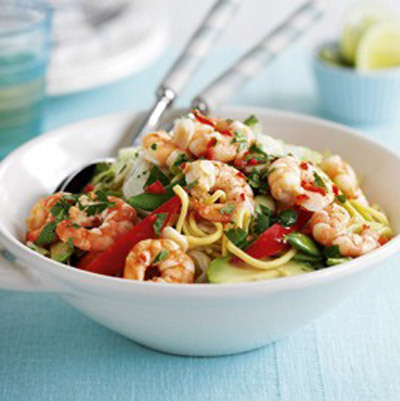 When the prawns turn pink, add them to the salad and top with the dressing and coriander. Serve immediately.